Today was a fairly decent day. I worked from 4 a.m. til 12:30 p.m. This was pretty cool because i came home and took a rad nap. I watched some of the film Koyaanisqatsi and American Psycho. At work we had employee lunch day where they served tacos and enchiladas. I tried some new beer tonight; which is something that i truly enjoy. 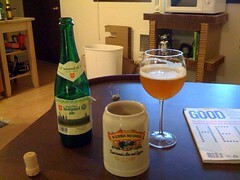 Tonight it was some good belgian ales that were recommended by a co-worker. Aaron Magnin, a close friend of mine has confirmed his lack of A.I.D.S. This entry was posted in Uncategorized and tagged childhood, Gangstarr, Koyaanisqatsi, neighbor. Bookmark the permalink.